Joe Clarke feels his game is already improving under the tutelage of Peter Moores, as he prepares to make his Specsavers County Championship debut for Notts. The Specsavers County Championship gets underway tomorrow, and the clash between Nottinghamshire and Yorkshire is being billed by many as the game of the weekend, as Stuart Broad prepares to face his England team-mate Joe Root. But it is also a game which could see the debuts of a number of players, with Clarke and Paul Coughlin awaiting their Notts Championship bows, along with Yorkshire’s Duanne Olivier and Will Fraine. Clarke moved from Worcestershire in the close season, having already proved himself with 12 first-class centuries while at New Road. But the right-hander believes the Notts Head Coach will give him the guidance to take his game to the next level. “Everyone’s been saying that Moores is one of the best around. I was eager to dive into that, and it hasn’t disappointed,” said Clarke. 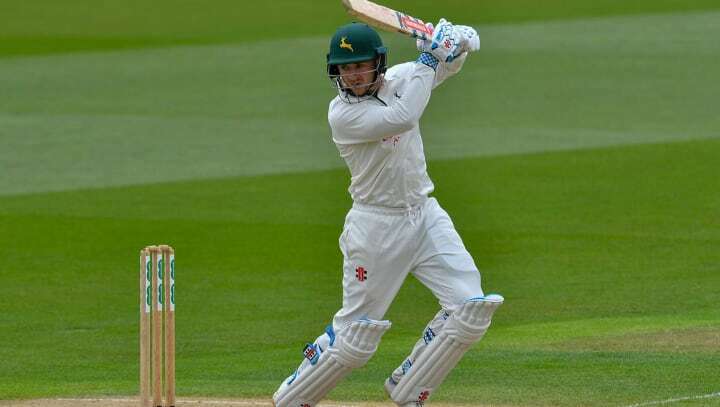 Notts will begin their quest for silverware at Trent Bridge in two competitions this month, with the first One-Day Cup fixture of the season against Lancashire coming hot on the heels of a four-day game against Somerset and the opener against Yorkshire. Clarke is already a trophy winner at county level, having helped Worcestershire to the T20 Blast title last season. And he hopes the talent in the Notts squad will allow him to push for more titles in the upcoming campaign. “I want to be at a club that can help me win trophies and push for higher honours myself. England Lions recognition has already been forthcoming for the stylish right-hander over the past few years, sparking newspaper talk of a senior call-up should he start the season well. But Clarke is not allowing himself to look that far ahead. “I don’t think you can ever feel like you’re the next one in [to the senior squad]. “Everyone’s on a level playing field in my eyes, and I’m sure it’ll be whoever puts their hand up and scores the most runs who gets picked. Nottinghamshire have named a 12-man squad to face Yorkshire, with Zak Chappell and Matt Carter absent through injury. James Pattinson arrives for his stint at Trent Bridge after the opening two County Championship fixtures. Nottinghamshire squad: Jake Ball, Stuart Broad, Joe Clarke, Paul Coughlin, Ben Duckett, Luke Fletcher, Jake Libby, Tom Moores, Steven Mullaney, Chris Nash, Samit Patel, Ben Slater.